Rosdhu Queen maintained her unbeaten record by making just about every yard of the running in the Jaguar Park Cheveley Park Stakes at Newmarket. 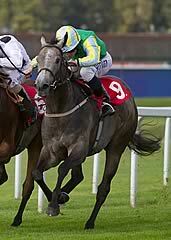 Sent off at 4-1, having won her previous three races, including the Lowther Stakes at York, Johnny Murtagh's mount just missed the break a little, but soon recovered to head the field. Heading into the Dip it looked as if she would be swallowed up by Lowther runner-up Baileys Jubilee, but Rosdhu Queen stuck her neck out gamely and quickened up again to win going away by a length. Winning Express stayed on strongly to take second place, while Baileys Jubilee finished third. 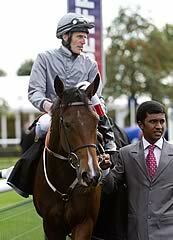 Murtagh said: "She travelled well on her own and didn't seem to mind it. She was on the rail and she wasn't getting any hassle. She's pretty fast, but maybe she'll mature over the winter. It's a quick mile here and maybe she should take her chance in the Guineas." Haggas said: "I can't say enough good things about her - she's really tough. Her coat has gone, but she can run. I think we ought to enjoy the moment before thinking about next year and consider things over the next four months. "I didn't think she'd stay six (furlongs) in the Lowther but she went again when she needed to. Whether or not she's a Guineas filly I don't know, but why not? She's a good, tough filly." Trainer Ed McMahon said of the runner-up Winning Express: "The winner just injected a bit of pace going into the Dip, and I'm not saying she was caught flat-footed but she just tends to switch off. "Franny (Norton, jockey) said she was doing her best work at the end and in another 20 yards she would have got there. I'm not sure her breeding suggests she will get a mile next year but she will certainly get seven furlongs." Trainer Mark Johnston said of Baileys Jubilee: "I'm very pleased with her. That will be it now, and she'll go straight for the 1000 Guineas."